“Sleepy Bill” Burns pitched for five major-league teams in five seasons from 1908 to 1912. At his peak, he beat Walter Johnson and Christy Mathewson. The great Ty Cobb, a left-handed batter, said he would rather bat against the right-handed Johnson than face Burns, a tough lefty.1 Burns was blessed with natural ability, but he was shuttled from team to team because he was egocentric, lackadaisical, and difficult to manage. In 1919 Burns infamously returned to the major-league scene as one of the conspirators in the Black Sox Scandal. 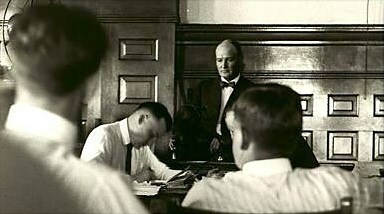 At the criminal trial in 1921, he turned State’s evidence in exchange for immunity from prosecution. His account of events has been accepted as factual, but veracity was not his strong suit. William Thomas Burns was born on January 27, 1880, in San Saba, Texas, and grew up on a farm there. He was part of a large Catholic family. His father, James Francis Burns, was an Irish immigrant, and his mother, Anna Cecilia (Peters) Burns, was a daughter of Irish immigrants. William was the sixth of 14 children born to James and Anna. In 1896 Anna stepped on a rusty nail and died from lockjaw. James remarried in 1901 and had four more children. San Saba was remote; before 1911 the nearest train station was 24 miles away.4 The community, with a population of 1,200, was visited in 1896 by Texas Rangers, who were sent to stop a violent vigilante gang known as the “San Saba mob.”5 It was the Wild West. William worked on the family farm. He was a natural athlete who excelled at baseball, football, and rodeo competitions, including roping, branding, and bronco busting.6 His pitching for the “Big Orchard ranch nine” in Texas attracted the attention of the baseball coach at the New Mexico Military Institute, who offered him “an education in return for slabwork.”7 After two years there, Burns ventured westward, and in 1905 he reportedly won 36 of 37 games pitching for a semipro team in Richmond, California, near San Francisco.8 He was a big man, described as husky and burly: 6-feet-2 and 195 pounds. His hairline receded in his twenties and made him look older than he was. During one of these close contests in Chicago, Burns fell asleep on the bench in the eighth inning while his teammates were batting and had to be awakened when it was time for him to return to the mound.18 He had no trouble falling asleep whenever and wherever he wanted. This trait earned him the nickname “Sleepy Bill.” He could also be seen nonchalantly reading a magazine or newspaper while on the bench during a game. Burns sustained a season-ending injury in late July of 1908, in an altercation with the Senators’ “hot-tempered” captain, Bob Ganley.24 Reportedly, Ganley struck Burns with a bat, fracturing two ribs. Burns recovered and in the winter pitched for the Reach All-Americans on a tour of Japan, China, and the Philippines. Hostility between Burns and Ganley continued in the spring of 1909. Senators manager Joe Cantillon rid himself of the problem by trading Burns to the White Sox and selling Ganley to the Philadelphia Athletics. In Chicago on July 11, Burns delivered a three-hit shutout against the Red Sox.27 He took “keen delight in harpooning his late associates on the Washington team.”28 Three times he defeated Walter Johnson and the Senators, including two shutouts.29 But Comiskey, who had a surplus of left-handed pitchers, grew tired of Burns’s attitude and sold him to the Cincinnati Reds in June of 1910. As a member of the Reds, Burns shut out the first-place Chicago Cubs twice in 1910, with a one-hitter on June 27 and a two-hitter on July 7, and he defeated the defending world champion Pittsburgh Pirates with a four-hitter on July 2.30 Sportswriter Ring Lardner asked, “Who is he?”31 The world wanted to know. In the book Tall Tales from Texas, folklorist Mody C. Boatright examined the genre: “Sometimes the listener was informed by a sell at the end of the story that he had been taken in; more often he was made aware of the fact by the sheer heights of exaggeration to which the narrative ascended; occasionally he accepted the story in good faith and went away neither sadder nor wiser.”36 The tall tale was an art form in Texas, something to master and be proud of. Burns was indeed a master and could easily fool unsuspecting greenhorns. When Burns was not spinning tales, he might be napping. Twice in May of 1911, Reds manager Clark Griffith wanted to put Burns into a game as a relief pitcher, only to find that Burns was not warming up as instructed but was asleep on the clubhouse bench.37 This was inexcusable; Griffith suspended him and then sold him to the Philadelphia Phillies. Awake on the Phillies, Burns shut out the Cubs twice in Chicago in 1911; the first was a four-hitter to defeat Mordecai “Three Finger” Brown on June 15, and the second was a one-hitter on September 19. And Burns beat Christy Mathewson and the New York Giants twice in Philadelphia in a span of three days, with relief help from rookie Grover Cleveland Alexander on July 3, and by going the distance in the first game of a doubleheader on July 5.38 If these four victories are excluded, however, his won-lost record for the Phillies was 2-10, including losses to both Brown and Mathewson. Joe Cantillon, now manager of the Minneapolis Millers of the American Association, wanted Burns and worked a deal with the Phillies to acquire him in January of 1912.39 But Burns was unwilling to accept a demotion to a minor league and instead signed a contract with the Detroit Tigers. There were conflicting reports about how this was arranged; either Burns bought his own release from the Millers, which permitted him to sign with the Tigers as a free agent, or the Millers sold him to the Tigers because he refused to pitch for the Millers. By a 12-4 margin on April 13, 1912, Burns and the Tigers trounced the Cleveland Naps in Cleveland, as Burns held slugger Shoeless Joe Jackson – the most famous of the Black Sox to be – to one single in five at-bats.40 But it was Burns’s last major-league victory. Eight days later he “blew up” in the 10th inning of a 4-0 loss to the Naps in Detroit, and in his final major-league appearance, on May 23, he was batted “freely” in a 5-2 loss at Washington.41 The Tigers then sold Burns back to the Millers. Shortly before Burns’s departure, the Tigers’ Ty Cobb was suspended by AL president Ban Johnson. To protest Cobb’s suspension, the Tigers refused to take the field on May 18 against the Athletics in Philadelphia. Tigers manager Hughie Jennings quickly assembled a replacement team consisting of amateur and semipro players from Philadelphia, and the makeshift lineup got walloped, 24-2, by the Athletics. At the recommendation of Burns, Jennings picked a 31-year-old Philadelphian named Billy Maharg, a former lightweight boxer, to play third base on this replacement squad.42 Burns and Maharg probably became acquainted the year before, when Burns was a member of the Phillies. The pair would figure prominently in the Black Sox Scandal. Burns pitched well for the Millers in 1912 and 1913, with a combined record of 18-11 in the two seasons, though he was sidelined for much of the 1912 season by illness and injury. In 1913 he delivered a one-hit shutout against the St. Paul Saints on May 29, and a four-hit shutout against the Toledo Mud Hens on July 13.43 In the latter contest, Toledo’s Jim Baskette threw a no-hitter but lost, 1-0. The Colonels released Burns in March 1915, and he rejoined the Los Angeles Angels. On May 5, he hurled a one-hit shutout of the Venice (California) Tigers.48 But he was now 35 years old and out of shape. On May 28 the Salt Lake City Bees took advantage of his immobility by bunting on him, which was, said the Los Angeles Times, “a mighty mean” thing to do to the “fat man.”49 Two more future Black Sox took part in that game. One of the bunters was a 22-year-old pitcher, Claude “Lefty” Williams, who posted a 33-12 record for the Bees that season. The Angels second baseman that day was 23-year-old Fred McMullin. The Angels released Burns in July 1915, and he signed with the Oakland Oaks. Against the Vernon (California) Tigers on August 5, he belted a ball that should have been a home run, but he collapsed from exhaustion when he reached third base and settled for a triple. “The game had to be interrupted for ten minutes to give Burns a chance to recuperate,” said the Oakland Tribune. “Even the umpires had to stand back and laugh at Burns.”50 When he returned to the mound the next inning still fatigued, the Tigers scored three runs off him, one scored by yet another future member of the Black Sox, 20-year-old Charles “Swede” Risberg. Burns also boasted that oil was discovered on his “farm down in Texas some time ago” and that he had enough money to “buy a major league ball club.”62 It is unknown whether he was referring to his father’s San Saba farm or some other farm in Texas, or whether it was fictitious. During his travels in 1919, Burns discussed more than oil. He and his pal, Billy Maharg, conspired with eight Chicago White Sox players to “fix” the 1919 World Series. In addition to those previously mentioned (Cicotte, Jackson, Williams, McMullin, and Risberg), the group included Happy Felsch, Chick Gandil, and Buck Weaver. In September 1920, Maharg told the story of the fix to reporter James Isaminger of the Philadelphia North American. Burns, but not Maharg, was indicted by a grand jury in October 1920, and by a second grand jury in March 1921. Both Burns and Maharg testified for the prosecution at the criminal trial in July. As fix insiders, their testimony was crucial to the prosecution’s case, but the jury acquitted the eight White Sox players. Commissioner Kenesaw Mountain Landis then banned all eight from Organized Baseball. The Black Sox Scandal has been thoroughly studied by historians. To re-examine it here in depth is beyond the scope of this biography. That includes the extent to which gambler Abe Attell was involved; Attell was clearly a prominent figure in the fix, though a credible case can be made that he may not have been the lead figure. The putative role of Burns as liaison between the Black Sox players and the group including Attell, and the duration of Burns’s involvement, are also murky issues that are explored in works devoted expressly to the scandal. Confessions given by Cicotte, Jackson, and Williams in 1920 reveal that the 1919 World Series was indeed fixed, but the details of the fix remain sketchy and subject to debate. It is likely that not all of the participants in the fix have been identified – and to reiterate, for those who have been identified, the extent of their involvement is unclear. It’s notable that AL president Ban Johnson wanted Burns to testify in view of being an insider; Johnson went to costly lengths to find Burns in Texas. Burns and Maharg did step forward to tell their stories. They appeared trustworthy and were applauded by the press for giving credible testimony at the criminal trial. However, newspaper coverage of Burns’s time on the witness stand (parts of three days) is also notable in showing that his customary charm was lacking – he spoke in a monotone and was barely audible. Only upon cross-examination did he perk up and show some wit. Much has been written since that presumes that Burns and Maharg were telling the truth. Yet, as noted previously, Burns was known for spinning yarns – in modern parlance, he would be called a “BS artist.” With the passage of time, it has become difficult if not impossible to distinguish the shades of gray in the accounts given by Burns (and Maharg). Burns and his wife separated in the 1920s, and in 1930 she was back home in Cincinnati and working as a clerk at an automotive company.68 In 1940 Burns worked in highway construction and resided in Calexico, California, near the Mexican border.69 He died of a heart attack in Ramona, California, on June 7, 1953, at the age of 73, and was buried at the Holy Cross Cemetery in San Diego. His brother, Charlie, said he lost track of Bill over the last 20 years of Bill’s life. The author thanks William F. Lamb for helpful discussions, as well as Jacob Pomrenke and Rory Costello for their input. This biography was reviewed by Norman Macht and Rory Costello and fact-checked by Alan Cohen. William F. Lamb, Black Sox in the Courtroom: The Grand Jury, Criminal Trial and Civil Litigation (Jefferson, North Carolina: McFarland, 2013). Jacob Pomrenke, ed. Scandal on the South Side: The 1919 Chicago White Sox (Phoenix, Arizona: SABR, 2015). National Baseball Hall of Fame file. 1 Altoona (Pennsylvania) Tribune, May 13, 1910. 2 San Saba (Texas) News, July 18, 1890. 3 B. Youngblood, “Suggested Cropping Systems for the Black Lands of Texas,” US Department of Agriculture, Bureau of Plant Industry, Circular No. 84, issued December 11, 1911. 4 Washington Times, March 11, 1909. 6 Sporting Life, April 4, 1908. 7 Washington Times, April 6, 1908. 9 Sporting Life, November 16, 1907. 10 Washington Times, April 19, 1908. 11 Washington Herald, April 24, 1908. 12 Washington Post, June 14, 1908. 13 Washington Post, May 10, 1908. 14 Minneapolis Star Tribune, April 1, 1912. 15 Cincinnati Enquirer, February 25, 1912. 16 Sporting Life, June 13 and 20, 1908. 17 Los Angeles Herald, July 1, 1908. 18 Washington Post, June 21, 1908. 19 Washington Post, July 8, 1908. 20 Sporting Life, July 18, 1908. 21 Sporting Life, May 2, 1908. 22 Sporting Life, October 10, 1908. 23 Washington Post, September 16, 1908. 24 Washington Post, August 3, 1908; Nebraska State Journal (Lincoln), January 17, 1909. 25 Chicago Inter Ocean, May 29, 1909. The attendance for the game in Detroit on May 28, 1909, was 3,704, according to the box score in the June 5, 1909, issue of Sporting Life. 26 Chicago Inter Ocean, June 10, 1909; Washington Post, August 22, 1909; Brooklyn Daily Eagle, July 13, 1910. 27 Sporting Life, July 24, 1909. 28 Sporting Life, August 7, 1909. 29 Sporting Life, July 31, August 7, and October 2, 1909. 30 Sporting Life, July 9 and 16, 1910. 31 Chicago Tribune, June 28, 1910. 32 Salt Lake Telegram, July 23, 1910. 33 Bridgewater (New Jersey) Courier-News, August 18, 1910. 34 Pittsburgh Press, May 18, 1914. 35 Winston-Salem (North Carolina) Journal, August 31, 1911. 36 Mody C. Boatright, Tall Tales from Texas (Dallas: Southwest Press, 1934), reprinted by SMU Press, 1982. 37 Wilkes-Barre (Pennsylvania) Times Leader, May 20, 1911. 38 Sporting Life, June 24, July 15, and September 30, 1911. 39 Minneapolis Star Tribune, January 8, 1912. 40 Sporting Life, April 20, 1912. 41 Sporting Life, April 27, 1912; Detroit Free Press, May 24, 1912. 42 Chicago Inter Ocean, May 19, 1912. 43 Minneapolis Star Tribune, May 30, 1913; Chicago Inter Ocean, July 14, 1913. 44 Sporting Life, December 28, 1912. 45 Minneapolis Star Tribune, December 10, 1913. 46 Minneapolis Star Tribune, August 14, 1914. 47 Minneapolis Star Tribune, September 12 and October 2, 1914. 48 Salt Lake Herald-Republican, May 6, 1915. 49 Los Angeles Times, May 29, 1915. 50 Oakland Tribune, August 6, 1915. 51 Oakland Tribune, November 1 and 7, 1915. 52 Oakland Tribune, June 30, 1916. 53 Salt Lake Telegram, October 20, 1916. 55 Salt Lake Tribune, June 19 and September 22, 1917; Pittsburgh Press, July 1, 1917. 56 El Paso (Texas) Herald, March 25, 1918. 57 Chicago Tribune, April 7, 1918. 58 San Saba (Texas) Star, May 16, 1918. 59 Houston Post, April 18, 1919. 60 Oil, Paint and Drug Reporter, September 8, 1919. 61 Minneapolis Star Tribune, July 22, 1919. 62 Brooklyn Daily Eagle, August 7, 1919. 64 Chicago Tribune, March 7, 1920; San Francisco Chronicle, March 12, 1920. 66 Corsicana (Texas) Daily Sun, October 20, 1925. 67 El Paso Herald, May 14, 1926.